Handmade of 100% High Quality Genuine Leather. These Men's Suspenders were designed for the Groom or Groomsmen to feel classic and sophisticated on that special day with just the right amount of rustic charm. Makes the perfect addition to any special occasion. Great Design & Excellent Craftmanship. Made to last a lifetime and they age beautifully over time. These very classy leather suspenders for men are the ideal accessory for a casual, put-together look. We love our suspenders for men paired with skinny black jeans and a relaxed white shirt or tee. 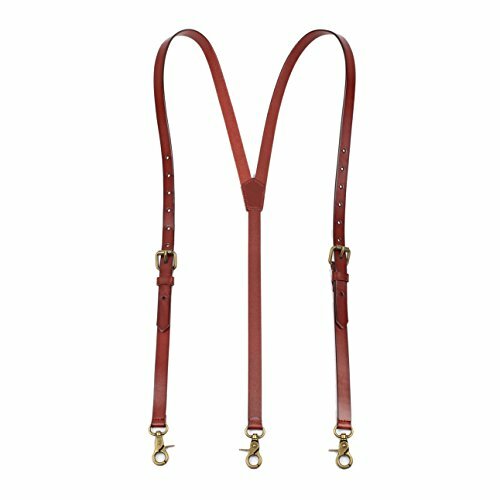 These Y back styled suspenders feature hooks clips attachments, high quality hardware and genuine leather detailing; ensuring they remain a staple in your wardrobe for years to come! Suspenders is Y-back style with metal back patch. It has a high quality belt with great elasticity and Snap Hooks are made of high quality strong metal.It does not hurt the clothes and could prevent slipping, not easy to fade,clamp pants strongly, easy to operate, sturdy and durable. AN AMAZING GIFT SET: Elegant, durable and comfortable, our Suspenders will make the perfect gift to the college student, the bridegroom, the graduating student, the performing musician! Offer it to your friend, brother, father or co-worker on their Graduation Day, Father¡¯s Day, Christmas or on their birthday and have the lucky recipient thankful for your excellent taste! 100% REFUND OR REPLACEMENT - If for any reason you are unhappy with any product by us, please do not hesitate to contact us. We take full ownership and responsibility for the quality of our products and will do our very best to solve your problem quickly and efficiently!